1. Morning Announcements: This is an easy way to help spread awareness in your school. Share our announcements early in the school year. See below for announcements and accompanying resources. 2.“What is a Food Allergy: Kids Awareness Module”: We encourage you to share this module with your students at some point this week. This 4 1/2 minute awareness module is designed for elementary age children without food allergies with the purpose of increasing empathy and support and discouraging bullying. 3. Posters: We have free posters for you to download. We chose one poster for each day of our morning announcements. We hope that you will add these posters to your school bulletin board or your classroom. 4. “School Staff Training Module”: This 30 minute module is designed to assist the school nurse in staff training of management of life-threatening allergic reactions and increase food allergy awareness for all school staff including teachers, food service personnel, administrators, aides, specialists, coaches, bus drivers, custodians and others.Topics include food allergy basics, label reading, common hidden ingredients, cross-contact, recognition of allergic reactions & anaphylaxis, how to give epinephrine, issues in specific school settings, and the social/psychological impact of food allergies. 5. Resources for PTA/Os and Parents of Children Without Food Allergies: We collaborated with National PTA to organize and share some resources designed to bring food allergy and anaphylaxis awareness to all parents in the school community. We thank Gina Lee for her help in creating the Morning Announcements. Did you know that 1 in 13 children has a food allergy? 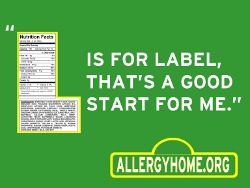 This means that almost everyone knows at least one person with a food allergy. This week we will be learning about ways we can support our classmates with food allergies. Your teacher also may share a short video about food allergies in class. Did you know that even tiny amounts of a food can cause an allergic reaction? You can help keep your classmates safe by washing your hands after eating. Cross Contact is the presence of unintended food allergen. Exposure to an allergen by cross contact is a common cause of allergic reactions. Cross contact of food allergen can occur from contact with surfaces, other foods, and with transfer of saliva. If a person is then exposed to these allergens, especially by mouth, it may be enough of an exposure to cause a serious allergic reaction. Keep in mind that allergens can withstand heating and drying and exposure to small amounts of allergen is enough to result in anaphylaxis. Saliva, whether from a person or a pet can contain allergens and therefore can be a source of cross contact. For this reason sharing of anything that goes in the mouth can become a source. If students have contact with pets, keep in mind that pet food can contain allergens. Preventing cross contact with cleaning is important. Establish a cleaning protocol to avoid cross contact. Allergens can also enter the system through the eyes, and nose. People with food allergies need to always take good care of themselves no matter where they are or who they’re with. Support your friends with food allergies by including them at lunch, recess and outside of school. Help them stay safe and have fun too! Food allergies can be life threatening. People with food allergies need to always take good care of themselves no matter where they are or who they’re with. Help students support their friends and help them encourage good choices. School-wide food allergy awareness can help create an environment of support and understanding. Direct student education may be very effective. Children also can play an important role in teaching each other, their parents, and play a critical role in establishing a supportive community. Let’s take good care of each other! Food Allergies are serious. If you see bullying of any kind, speak up. Bullying is never OK but when it comes to food allergy, bullying can be down right dangerous. Be an ally and take good care of each other. It’s no joke! While swiftly dealing with bullying is critical, stopping food allergy related bullying before it starts is an important and achievable goal. Students can pick up on the messages of their teachers, parents, and others in the school community and bullying may arise when there are misperceptions and negative attitudes about food allergies. Replacing these with education can create an environment of support and understanding. Educating staff and parents can change the attitudes of children. Direct education to students may be very effective. Children also can play an important role in teaching each other, their parents, and play a critical role in establishing a supportive community. We can teach bystanders to be allies who support and look out for their peers.